Details : Ht 26" TET. Ev. M. Re. Bl 5"
An unusual silvery-lavender mauve with a chalky slate blueish eye and a cream chartreuse throat. Limited stock - 1 per customer. Details : 24" SEv. Dip. E-M. Re. Bloom 6"
A very pretty lavender pink with purple eye and green throat. Ruffled, paler edges. Perfectly rounded blooms. Hardy and prolific. Limited stock - 1 per customer. Details : Ht 18" TET. Ev. M Re. Bl 7"
A lavender-mauve with a very heavy gold edge. Yellow-green throat. Limited stock. Details : Ht 22" TET - Ev. M Re. Bl 4.75"
Details : 20" Ev. Dip. M. Re. Bloom 5.5"
Lavender blue self with an orange gold throat. Lovely colours and form. Details : 26" SEv. Tet. E-M. Re. Bl 6"
Details : 26" Ev. Tet. E-M Re. Bl 4.75"
Lavender with a large dark purple eye. Very Prolific. A great performer. Details : 18" - 26" SEv. M-L Re. Bl 4.5"
Deep lavender smallish blooms with halos of vivid lavender, purple and blue. Blooms displayed on tall scapes for the size of the blooms. Details : 23" Dor. Tet. M Re. Bl 5"
A beautiful pale lavender cream with a grey mauve lavender eye and edge. Details : Ht 22" TET. SEv. E-M. Re. Bl 5"
Limited stock 1 per customer. Dark clear lavender with bubbly gold edge..Large centre of cool green. A favourite. 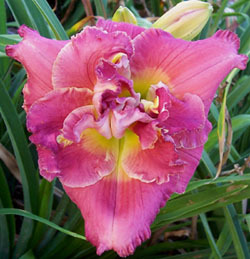 H.L's puts on a magnificent display with many blooms out at once over a long period of time. A lavender blend with a large lighter watermark over a green throat. Details : 27" SEv. Tet. M. Bl 7"
Rose Lavender with a large ruffled gold edge. Details : 22" Dor. Tet. EE Re. Bl 7"
Clear lavender with gold edges. Details : 25" Ev. Tet. E-M Re. 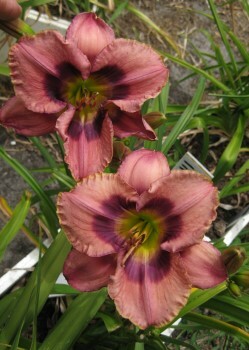 Bl 6.5"
A large clear dark lavender with yellow throat. Limited stock. Details : Early - Mid. Ht 102 cm / 40". 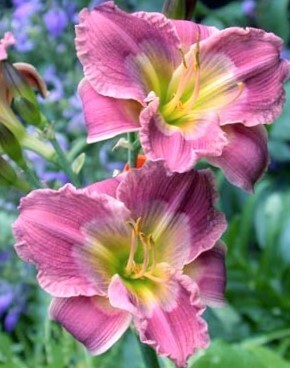 Bl 6"
NEW Release for 2015 - Exclusive to Rainbow Daylilies & Irises only. Lovely ruffled lilac falls and paler lilac ruffled standards. Yellow signals. A Vigorous and showy grower. Details : 27" Dor. Tet. E-M. Re. Bl. 5.5"
Rounded amethyst lavender blooms with diamond dusting. Ruffled. Details : Ht 30" TET. Ev. E-M. Re. 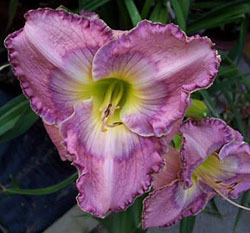 Bl 6½"
Attractive blooms of a lavender blend with darker eye surrounding a large green throat. Petals have dark purple and gold braided edging. Details : Ht 27" TET Ev. E Re Bl 7"
Medium blue lavender with a shaded pattern eye above a green throat. Unusual Form. Details : 22" SEv. Dip. E-M. Re. Bloom 5"
Lovely clear blue lavender with a green throat. White midribs. Details : 26" Ev. Tet. E - M Re. Bl 7"
Large lavender blooms with a blue eye and edge above a green throat. Unique. Details : 22" Ev. Tet. E-M Re. Bl 5.25"
Deep lavender with a pale lavender blue eye and edge. Limited stock 1 per customer. Details : 29" Ev. Dip. M. Bloom 6"
A lovely clear bluish lavender with a blue eye and white midribs above a green throat. Limited stock - 1 per customer. Details : Ht 40" TET.Ev. E Fra. Re. Bl.10"
Subtle blends of clear pink and clear lavender with a little graying. Details : Ht 20" SEv. TET. Mid Re. Bl 6"
Lavender with a golden centre and gold ruffled edge. Limited stock. Details : 25" Ev. Tet. M Re. 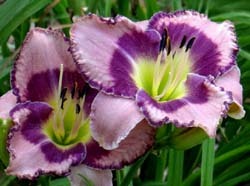 Bl 5.75"
A soft lavender bloom with a blue watermark eye and blue ruffled edging. Pretty with a high bud count. Details : Ht 30" TET. Ev. E Re.Bl 5"
A lavender with a blue lavender eye and edge bordered in silver or gold. Colours can vary slightly with each flush. Details : Ht 27" TET. Mid Re. 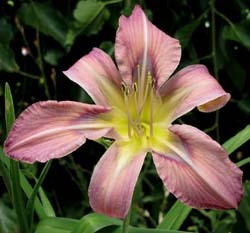 Bl 6"
Large lavender pink with a gold ruffled edge and green to yellow large throat. Details : Ht 28" DIP. Ev. E-M Re. Bl 7.25"
Large triangular lavender pink with a dark red eye surrounding a pale lime/yellow eye. Very pretty with nice ruffling. A favourite. Details : Ht 28" TET. SEv. E-M. Re. Bl. 5.½"
A lavender rose with a striking electric violet-blue eye that shines. Lime green throat. Details : 24" SEv. Tet. M Re. Bl 5.5"
Details : 32" Dor. Dip M Re. Bl 8.5"
Pale lavender blend with a largea green throat. A great spider with class and elegance. Both petals and sepals curl. High bud count. Details : Ht 24" DIP SEv M Re. Bl 4"
Pale lavender mauve with washed cream violet eye above green throat. Details : 30" Ev Tet. EE Re. Bl 7"
Orchid lavender with an enormous green throat that covers most of the slender petals. Thin miniature type foliage. Limited stock - 1 per customer. Details : 26" Ev. Tet. L. Re. Bl 6"
Clear lavender with a large yellow watermarked throat and a small green heart. Sepals are a paler lavender. Limited stock - 1 per customer.